Update October 2, 2018: Morano's Facebook video goes over 9.4 million views! Morano's Facebook video debunking climate change claims for the Heritage Foundation's Daily Signal has gone viral on Facebook, garnering 7.5 million views and over 128,000 shares. 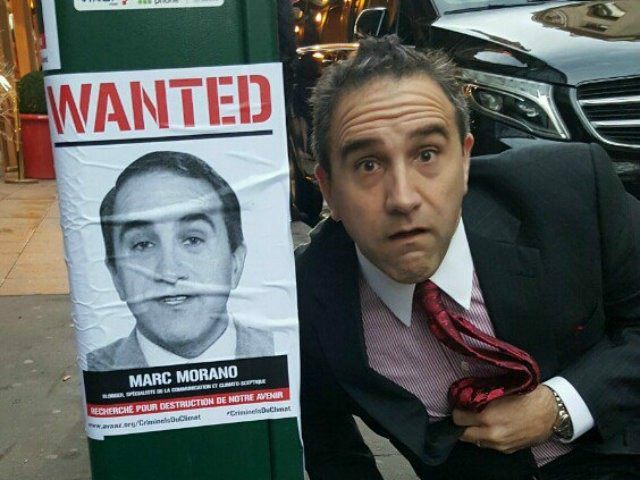 Climate Depot’s Marc Morano has become the poster child of climate activists seeking to ban “climate deniers” from Facebook and YouTube and other social media platforms like Twitter. Morano’s Facebook video for his new best-selling book, “The Politically Incorrect Guide to Climate Change,” debunking climate change claims for the Heritage Foundation’s Daily Signal has gone viral on Facebook, garnering more than 7.5 million views and over 128,000 shares. Another high-profile attack on Morano’s book was the George Soros funded Media Matters for America. “Facebook has a climate-denial problem,” stated the July 31, 2018 headline. Climate activists have Facebook in their crosshairs in order to stifle any climate debate. 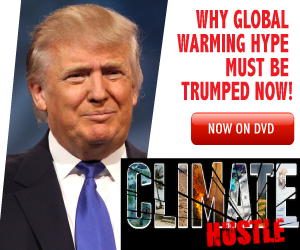 “The platform spreads climate-denying videos and other posts, hosts climate-denying ads,” Media Matters noted. “As of this writing, the Daily Signal video has now been “viewed’ 6.3 million times and shared 102,000 times,” wrote Media Matters. “Zuckerberg has expressed concern about climate change, arguing last year that the U.S. should not pull out of the Paris climate agreement and noting that rising temperatures are melting the glaciers at Glacier National Park,” Media Matters wrote. Other climate activists have piled on with attacks on Zuckerberg. “Joe Romm at ThinkProgress pointed out that Zuckerberg’s approach is a major problem when it comes to climate denial,” Media Matters added. Heritage Foundation’s Robert Bluey: Despite that intimidation, you’ve still gone on to write this book. So what prompted you to do that and what’s your goal when a reader picks it up? What do you want them to walk away with? Marc Morano: My goal here was to help conservatives and Republicans articulate the issue. During my time on Capitol Hill, I worked for the Senate Environment of Public Works Committee. I can’t tell you the horror stories, Rob, of being in high-level meetings, during the height of the cap-and-trade debate 2007, 2008, 2009; back when President Barack Obama was pushing this through all the way to 2010. I remember arguing passionately. If people think we face the climate catastrophe, we’re Americans! They’re going to say we will bear any cost and overcome it. They never wanted to challenge it. So I’m trying to, and working for Sen. James Inhofe, we tried to challenge the science. What I tried to do with this book is say it’s OK to espouse climate skepticism. The book is done for anyone from, I would say, sixth grade through highest levels of education to educate them with the top voices in science, the basic concepts, and to make it fun, informative in a talking point form. This is a needed book because in order to fulfill President Trump’s policies, you need the scientific justification, and this book fills that gap in, as well as talks about the policy. There is nothing unusual, particularly on extreme weather. It’s not just hurricanes. Hurricanes, floods, droughts, tornadoes, on the entire spectrum of extreme weather, we are either at stable or declining trends. And that includes droughts. California droughts in previous centuries blew away anything we’re talking about now. Floods, no trends on 100-year, 85-year time scales. Hurricanes were much worse, many more powerful hurricanes in the 1940s and ’50s. In fact, we were in the longest period of no major hurricane category three or larger before last year’s big hurricanes hit. And even though there is this alleged record rains, in the 1960s hurricanes that hit Cuba had many more times rain and flooding events than that. I go into that in the book about these so-called 1,000-year floods and I explain that all these extreme weather events they claim, it’s kind of like a lottery promotion scam. Where they say, “Oh, this is a 1,000-year storm hit this city, and a 1,000-year storm hit that, this is unusual.” No, there are going to be very few lottery winners. But the lottery winners there are, they highlight them. “Look, there’s a lottery winner and there’s a lottery, look the lottery winners are everywhere.” They make it seem like extreme weather is everywhere. But taken as a whole, and in the peer-reviewed literature, it’s actually on a declining trend. Interestingly enough, cold weather is actually more extreme than warm weather. In the 1970s, they blamed tornadoes, floods, even the threat of war and increased violence on global cooling at the time. So there’s just not the science there at all, when it comes to that. And also I go through all the other myths you’ve heard about from the hottest year on record, the hottest decade. Bluey: Let’s tackle that one because we hear this one it seems month after month—another record-breaking month…Tell us what we need to know. Morano: First of all, in the book, I interviewed geologists, I have Nobel Prize-winning scientists endorse the book. They explain that in the geologic history of the Earth, we are in the coldest 10 percent of the geologic history of the Earth. In other words, 90 percent of our Earth’s history was too warm to have ice at either pole. So we are in the 10 percent coldest. That’s No. 1. No. 2, if you go back to the Roman warming periods during the time that Jesus Christ walked the Earth—and I show this in the peer-reviewed studies in the book, in a very reader-friendly way—we are actually now cooler than we were. So we’ve cooled since the time Jesus Christ walked the Earth. We’re actually about the same temperature or cooler since the medieval warm period, since about 900 to 1300. First of all, you say hottest year, what time scale? Then, you jump ahead to about 1850, the end of the Little Ice Age, where the New York river, New York Harbor froze over, the Thames river was frozen, it was a brutal period, coinciding with low sun spot activity and bunch of other factors. Suddenly, we get thermometer data. So the thermometer data comes online right at the end of the Little Ice Age. It’s very cold. All these things you hear about the glaciers retreating, most of that glacier retreat happened by 1900. Now, 80 percent of the carbon dioxide came after 1940, or after World War II in 1945. We had a huge warm spell from the 1920s into the ’30s and then, we had a cooling period from the ’50s all the way up to about the late 1970s. I go into the whole global cooling scare. They now claim, “Oh, that never happened.” They have studies out, they claim that that was overblown, there’s only a couple scientists. I show in the book it was National Academy of Sciences, CIA, some of the same scientists warning of global cooling in the ’70s who then flipped and became global warming. I actually feature in the book an article from the 1977 and ’78 in The New York Times, two articles. During this time, the scientists were battling it out when global cooling was morphing into a climate change, global warming. To answer the question on the hottest year, we warm from the late ’70s to the late ’90s. Then essentially we flatlined. Essentially, there’s no statistically significant global warming. We had a thing called “the pause.” They didn’t like that, so they actually went back in the records and erased the pause. They changed the data. Besides, even doing all that, the hottest year claims are within hundredths of a degree and that margin of error is tenths of a degree and they adjust the temperatures to within tenths of a degree without explanations. The so-called claims of the hottest year fall easily within the margin of error. That’s why it’s a political statement. It is utter nonsense from beginning to end. It’s a fancy way of saying the temperature hasn’t changed since the ’90s. That’s where they get hottest decade on record. On record just means since the Little Ice Age ended, when we put thermometer data out and that’s what that means. If you go back further, we’ve cooled, Middle Ages, Roman warming period, and even further. Bluey: Thank you for setting the record straight on that. One of the other things that you argue is that the left has abandoned this fact-based science and instead resorted to just dramatic fear-mongering. What do you mean? Morano: Go back to the 19th century, Rob, to explain this. Every storm is allegedly unprecedented, we’ve never seen it, this is the new normal, so to speak. This hurricane has a name, it’s Hurricane Katrina. This hurricane has a name, it’s Hurricane Harvey. The same lines over and over. Everything is done as a tactic of fear in order to get action. This started in the 1960s with the modern environmental movement. Particularly, I go into a little bit about Paul Ehrlich, author of “The Population Bomb.” I actually show, Rob, that they use this hysteria for the different environmental scares in the 1970s, whether it’s resource scarcity, over-population, rainforest clearing, et cetera. They will say, “We need a global solution; we need global governance; we need wealth redistribution; we need sovereignty threatening treaty, or some kind of economic activity limiting.” No matter what environmental scare in the past that they tried to scare people with, it was the same solutions they’re proposing now. They’re open about it. They use the climate scare tactics to achieve their ends. And in order to get those ends achieved, they have to hype and scare. It’s been a very effective strategy because they’ve bullied Republican politicians, who should know better, into at least submissiveness and silence and/or activism, when you come to the case with John McCain and even Mitt Romney. Bluey: What are some of the strangest things that you’ve seen the left blame climate change on? Morano: There’s a whole series of things. One of the things they do is they make opposite predictions. Global warming will cause more snow, less snow. More hurricanes, less hurricanes. More fog, less fog. More malaria, less malaria. I go through it all. It’s as if you bet on the Super Bowl, and you bet both teams to win. You can go to the office the next day and say, “I did it! I won! I bet on the winning team.” First of all, they’re never wrong because they literally have opposite predictions. The second thing is they come up with everything. Global warming will cause an increase in prostitution, bar room brawls, vehicle thefts. These are by United Nations scientists who did these studies, funded by major universities. These aren’t just some wacky claim, or some professor talking off the top of his head. They actually get funded studies to do this. One of my favorites was in 1941, a University of Cincinnati professor said that the warmer weather we were having in the 1930s and ’40s created more docile people, which led to them being more susceptible to Hitler, Mussolini, and dictators. They actually blame the rise of Hitler on global warming at that time. Oddly enough, Hitler was saved in the bunker when Von Stauffenberg tried to kill him. Because it was a very hot day, they had to move the location of that meeting when the assassination attempt happened. They moved it to a room with a heavy table that saved Hitler. Global warming created Hitler, global warming saved Hitler. There are so many wacky things that they’ll blame on global warming. My favorite quote is probably Michael Oppenheimer, U.N. lead scientist, former Environmental Defense Fund activist, “Anybody who eats is under threat from climate change.” That’s his summation. So there you go. It’s that combination of just about everything. If you eat, then you’re under threat of climate change, you should be worried. If you don’t eat, then you’re fine. Even when you’re dead, you won’t escape the clutches of global warming. In the book, I show multiple examples. In one case, Peruvian mummies are decaying faster because of the humidity caused by climate change. Also, they’re worried that dead bodies in the permafrost in Siberia are melting and are going to release new pathogens. The dead walk among us because of global warming. So, even the dead are now to blame for exacerbating the problem of global warming. Bluey: We’ve used these terms interchangeably: climate change and global warming. Can the left make up its mind on what to call it? Former Sen. Barbara Boxer, when I was in the Senate Environment Public Works Committee, she actually called the hearing “global warming” one time. This was when they were really trying to push climate change. Temperatures hit their peak in the late 1990s from the cooling of the 1970s. They’ve tried to push climate change because they didn’t think without that constant increase in temperature, they weren’t getting anywhere. It was getting harder to sell. Climate change includes the extreme weather. I remember very vividly, I was in Bali, Indonesia—a $15,000 roundtrip business class flight for the U.S. Senate at a global warming hearing for the United Nations—arguing with a John McCain climate staffer about how the new argument in global warming was all going to be about extreme weather. Therefore, climate change had to be the new moniker because global warming was too focused on temperature. They wanted to go out on every limb and this way they could blame everything from cows and transportation, airlines. They’re trying to get every aspect of our society under global warming regulation and not just focus on temperature. Because now if you have a bad crop, if you have vehicle crash—the Department of Transportation got us funding to study how global warming could increase fatal car accidents—that’s why it has to be “climate change,” because they’re trying to go in every direction. Bluey: How have the left’s policies, as you argue in the book, hurt the world’s poor? This is a white, wealthy Western politician saying essentially there are too many black Africans. Let’s be blunt about it. I actually quote a former Harvard professor just excoriating Al Gore for essentially racist comments. Basically singling out Africa and saying, “They’ve got to have better fertility management because we have too many Africans and we’ve got to control their population.” Now Al Gore would just say, “No, I’m thinking of only the Earth.” But what conservative politician could get away with that? When you look at third-world development—and by the way, “third world” is a politically incorrect term; we’re supposed to say the “developing world”—they have about 1.1 billion people without running water and electricity. Essentially, what they’re trying to do with climate policy is prevent them from developing through fossil fuels. Fossil fuels are the most abundant, cheaply available, and fastest way out of energy poverty, which means they’re the lifeline for lowering infant mortality, longer life expectancy, modern dentistry. If you’re living in a poor nation, you’re burning dung, you’re living in a hut made of dung, you’re breathing in horrible air, the rivers are polluted from sewage. The second you get modern sewage, the second you get coal plants even or oil or even nuclear, if you’re lucky enough, everything gets radically cleaner. They’re trying to prevent it. Even the World Bank won’t allow coal plant development in countries that are in dire poverty. I interviewed Jerry Brown, the California governor, at an Earth Summit in South Africa. He actually says the Earth can’t allow the rest of the world to develop like the United States and Europe because we’d need 20 more Earths to do it. In other words, they have to be managed. It’s a new form of colonialism. It’s the most insidious things. That’s a very intense chapter in the book because it’s an eye-opener for people who haven’t been following this. They are trying to limit their development. End Morano interview excerpt. For Full article see here. Editor’s Note: The following is an excerpt from author Marc Morano’s new 2018 best-selling book, The Politically Incorrect Guide to Climate Change. The section below deals with the alleged 97% consensus on climate change. In 2017 Princeton Professor Emeritus of Physics William Happer drew parallels to today’s man-made climate change claims. “I don’t see a whole lot of difference between the consensus on climate change and the consensus on witches. At the witch trials in Salem, the judges were educated at Harvard. This was supposedly 100% science. The one or two people who said there were no witches were immediately hung. Not much has changed,” Happer quipped. “You take 400 economists and put them in the room and give them exactly the same data and you will get 400 different answers as to what is going to happen in the economic future. I find that refreshing because it tells me that these guys don’t have an agenda. But if you take 400 climatologists and put them in the same room and give them some data about a system which they understand very imperfectly, you are going to get a lot of agreement and that disturbs me. I think that’s arguing with an agenda.” —geologist Robert Giegengack of the University of Pennsylvania. The alleged “consensus” in climate science does not hold up to scrutiny. But what about the specific claim that 97 percent of scientists agree? MIT’s Richard Lindzen has explained the “psychological need” for the 97 percent claims. “The claim is meant to satisfy the non-expert that he or she has no need to understand the science. Mere agreement with the 97 percent will indicate that one is a supporter of science and superior to anyone denying disaster. This actually satisfies a psychological need for many people,” Lindzen said in 2017.
percent claim was despite the fact that 66.4 percent of the studies’ abstracts “expressed no position on AGW” at all. “The 97% estimate is bandied about by basically everybody. I had a close look at what this study really did. As far as I can see, this estimate just crumbles when you touch it. None of the statements in the papers are supported by the data that is actually in the paper,” Tol said. “But this 97% is essentially pulled from thin air, it is not based on any credible research whatsoever.” Tol’s research found that only sixty-four papers out of nearly twelve thousand actually supported the alleged “consensus.” Tol published his research debunking the 97 percent claim in the journal Energy Policy. Meteorologist Anthony Watts summed up Tol’s research debunking Cook’s claims. The “97% consensus among scientists is not just impossible to reproduce (since Cook is withholding data) but a veritable statistical train wreck rife with bias, classification errors, poor data quality, and inconsistency in the ratings process,” Watts wrote. Another survey that claimed 97 percent of scientists agreed was based not on thousands of scientists or even hundreds of scientists …or even ninety-seven scientists, but only seventy-seven. And of those seventy-seven scientists, seventy-five formed the mythical 97 percent consensus. In other words, in this instance the 97 percent of scientists wasn’t even ninety-seven scientists. This was a 2009 study published in Eos, Transactions American Geophysical Union by Maggie Kendall Zimmerman, a student at the University of Illinois, and her master’s thesis advisor Peter Doran. As Lawrence Solomon revealed in the National Post, The number stems from a 2009 online survey of 10,257 earth scientists, conducted by two researchers at the University of Illinois. The survey results must have deeply disappointed the researchers—in the end, they chose to highlight the views of a subgroup of just 77 scientists, 75 of whom thought humans contributed to climate change. The ratio 75/77 produces the 97% figure that pundits now tout. The two researchers started by altogether excluding from their survey the thousands of scientists most likely to think that the Sun, or planetary movements, might have something to do with climate on Earth—out were the solar scientists, space scientists, cosmologists, physicists, meteorologists and astronomers. That left the 10,257 scientists in disciplines like geology, oceanography, paleontology, and geochemistry that were somehow deemed more worthy of being included in the consensus. As Solomon explained, those two points do not give a complete picture of what’s at issue. They don’t even mention carbon dioxide—which, as we’ll explore at length in the next chapter, is the heart of the climate change debate. “From my discussions with literally hundreds of skeptical scientists over the past few years, I know of none who claims that the planet hasn’t warmed since the 1700s, and almost none who think that humans haven’t contributed in some way to the recent warming—quite apart from carbon dioxide emissions, few would doubt that the creation of cities and the clearing of forests for agricultural lands have affected the climate,” Solomon pointed out. 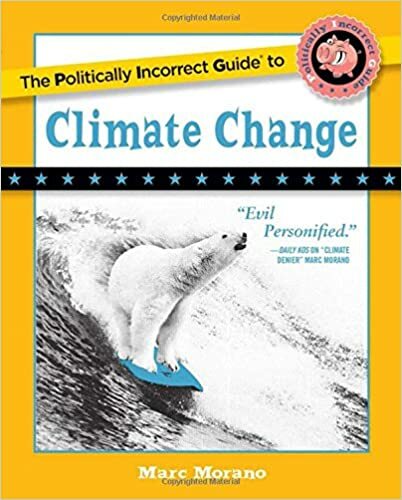 End The Politically Incorrect Guide To Climate Change book excerpt.